You've seen it a thousand times ? Yes, I'm sure... But it's not easy to photograph it without any traffic around it. That is why I'm taking advantage of being in Paris in August, to revisit my classic monuments! For those of you who would not know it, this is l'Opéra Garnier (often called le Palais Garnier), named after the architect who won the competition in 1861 and completed it in 1874 (yes they already had budget problems at that time!). 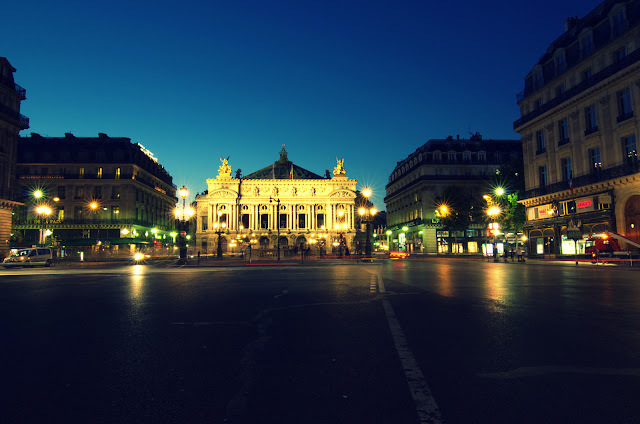 It's one of the two main opera houses we have in Paris (the other one being the Opéra Bastille, a more modern building) and yes, it's beautiful, especially at night. you can its - very interesting - story here. Good heavens Eric. Did you lie down in the street to get this at 2:00am????? Amazing shot. Take a bow for this one. @Virginia "Good heavens Eric. Did you lie down in the street to get this at 2:00am?????" No, it was actually earlier than that, but I'm telling you, at the moment Paris is really empty - except for the tourists, who don't drive! @Jeff Mings. "C'est certainement interessant" C'est surtout très agréable ! Once again, your photos start my day in a wonderful way. Beautiful! Beautiful! That is quite gorgeous. So, is Paris in August the time to come, or the time to avoid? @Christie. Good question! I would say a good time to come at the risk of not seing "the real Paris". The whole pace is much slower, a lot of stores are closed, the open ones are often empty (waiting for the back to school deliveries), the are works everywhere and a lot of Parisians are gone. Which makes it a wonderful time for those who stay! I have no trouble find a parking space for my scooter anytime of the day! having the city to myself (well, almost). Beautiful photograph, Eric! I hope you will be having some vacation time for yourself this month! @Monnica. Just a few days, thanks for your wish ;-) I'm not too keen on taking vacation in the summer time as 1) I love Paris at this time 2) I like to go far away when I go on vacation like the Southern hemisphere! Did you take some time off already?